Vets are urging dog owners to be aware of Lyme disease, a tick-borne illness that can affect both dogs and humans. The first thing you need to know is that an infected tick has to be attached to a dog or human for more than 24 hours to spread Lyme disease. If you find a tick on your pooch, it would be best to have your vet remove the tick because the tick’s head and mouth may become a source of serious inflammation and infection. Apart from affecting the heart, brain and kidneys, the most common sympoms of Lyme disease include a red skin rash, painful gait or lameness, fever and/or reluctance to move. If your dog exhibits some of these symptoms, take your dog to your vet immediately. In order to protect your dog from Lyme disease, you should use flea and tick preventative medication, remove ticks from your dog as soon as possible, frequently check yourself and your dog for ticks, and brush your dog after spending time outdoors. 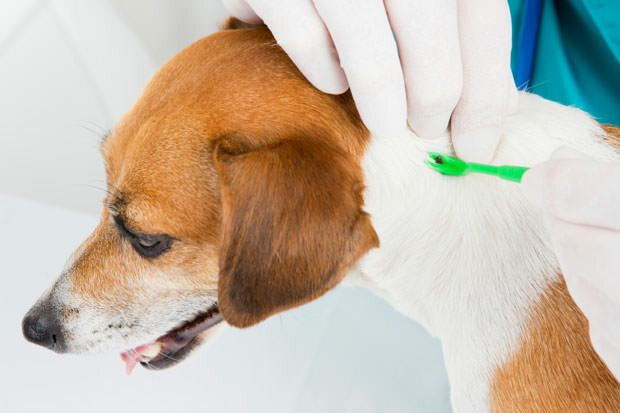 Of course, you can also vaccinate your dog against Lyme disease in order to stay safe. Next Story → Nylabone Dog Chew Contaminated With Salmonella?